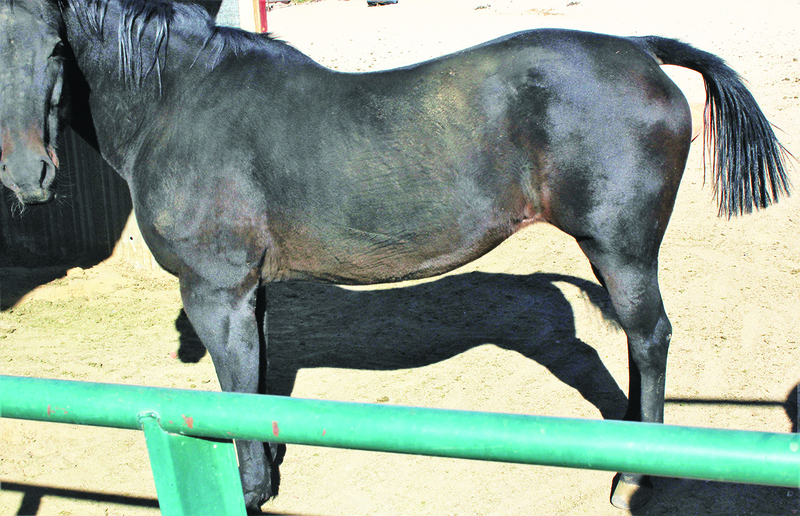 Last week, one of the eleven horses involved in the brutal July 3 slashing incident at the Big Pine Saddle Club, which received widespread local attention and outrage, was found by its owner with about two-thirds of its tail missing. It had been cut off overnight. The Sheet left a voicemail a few days ago for the president of the Saddle Club, Shelly Snoderly, to ask for more information, but did not receive a response. And while a few club members admitted to hearing about the incident, few wanted to talk on the record, citing concerns over more negative publicity for the club. It is unclear whether this incident was reported to the Inyo County Sheriff’s Department and/or whether it is being investigated. As to the horse (pictured above right), the corral which it shares with another horse sits alongside Baker Creek Road, which runs alongside the Saddle Club property. This, unfortunately, would make it all too easy to slip onto the property and into the corrals without being observed. The only solution would be lighting and 24-hour security surveillance. Despite the trauma suffered by these horses several months ago, and now the latest horse tail theft, the horses still readily approach a visitor, which speaks to the trust they hold for their owners and the loving care they receive. A horse’s tail can take years to grow back. Horses use their tails to communicate. If a horse hides its tail between its legs, it is usually signaling fear, and if it is spinning its tail, it usually means that it is angry or annoyed. They raise their tails when they are excited. And without a tail, horses have no way to fight off flies that often plague them. It’s not just a simple “haircut.” It can have serious consequences. It is animal abuse and cruelty. It is also theft. Horsehair theft has become common over the past several years. It often includes cutting both the mane and tail of a horse. There is an incentive. Online horsehair lists for an average price ranging between $25 to as high as $75 a pound depending on color and quality. Horsehair can be bought in a variety of colors such as black, brown, white, blond and silver grey, as well as an assortment of dyed colors. Various explanations were offered by club members as to why someone would enter a corral in the dead of night to cut off a horse’s tail. One long-time member said it has happened several times before over the years. Reasons cited range from horsehair being used in some Native-American regalia outfits—although no one was pointing fingers—to use as tail extensions on show horses. Horsehair is also traditionally used in string bows for violin, viola, cello and bass, although there have been no rogue, criminal string bands reported in the Big Pine area … well, at least not yet. In a phone interview with The Sheet, Inyo County Sheriff Jeff Hollowell noted that he has often seen products made from horse hair sold at truck stops and other places, such as belts, hats, bracelets, necklaces and key chains. Bracelets and necklaces that sell for as little as $10 can be a very lucrative business, especially when stolen horsehair is used to make them. If the incident is reported, Hollowell said that the department will start an investigation. Saddle Club Treasurer Yvette Hannon-Rossi told The Sheet that approximately $8,500 was raised locally and through the online GoFundMe.com fundraising website this past summer. It will be used to improve lighting and security at the facility. Electrical poles are already being placed around the facility, and once electrical service becomes available, the club plans to move quickly forward on installing security lighting and security surveillance cameras. If this latest incident at the saddle club proves nothing else, it is that some people will still go to great lengths for a little tail.